Balsamic Chicken with Roasted Vegetables – What's for Dinner Moms? My son also had Science Olympiad in the middle of all the Irish dancing my daughter did this week. His middle school team came in first in Regionals so they will be heading States at the end of April. He was so very excited. This is their Scrambler car. They have been working on it for months. 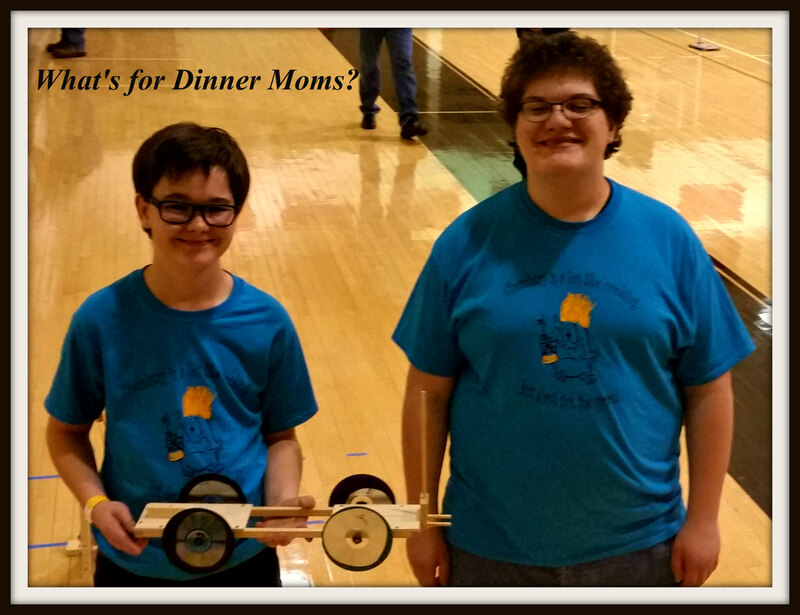 They attach an egg to the front two prongs and launch the car towards a wall from a distance given to them by the judges. The vehicle is supposed to get as close to the wall as possible without breaking or cracking the egg. They came in 2nd place in this event! My son also came in 2nd in Crime Busters and 3rd in Picture This (Pictionary with scientific terms). He was very proud of his medals and his team. Yes, I am a real mom,just like many of you, that doesn’t stay at home all day cooking and taking pictures of her dinners. I am a quick picture as the food comes to the table and hoping it isn’t too dark to see the meal. I am trying to feed my family good, interesting food and get us to the dinner table as easily as possible. Meal times are important to us for communication about what’s going on in our family but also for discussing our beliefs about larger issues. Last night our dinner topic was politics. Not a fun topic but we feel strongly about talking about each candidate and how they do or do not represent our family values. Tough topics but over dinner it is easier to discuss because we are relaxed and so are the kids. So, our dinner needed to be on the table quickly and simply with all the craziness of life happening. We had two days off before heading back out with my daughter for more Irish dancing this week. This was a nice, hearty, dish. I served it with extra balsamic vinegar on the side for those that wanted more (my daughter would drink the vinegar if I let her) and a loaf of crusty bread for soaking up all the extra juices. You could serve it over rice or noodles if you like but there really is no need to. Make sure all your ingredients are gluten-free for this dish if you want to serve it gluten-free. My mostly gluten-free son loved it! Pre heat oven to 450 degrees. Once all your vegetables are cut and prepared spray a LARGE casserole pan with non-stick spray. Add all vegetables to the pan. Mix together oil, oregano, basil, powdered garlic and chicken broth. Stir until well combined and pour the mixture evenly over the vegetables in the pan. Add the minced garlic to the pan and stir until all vegetables are well coated. Cover pan with aluminum foil and bake vegetables in oven for 30 minutes. Once vegetables have cooked for 30 minutes removed them from the oven. Add chicken and balsamic vinegar to pan. Stir will to combine all ingredients. Return pan to oven, uncovered, for an additional 25 to 30 minutes. Pierce the largest pieces to test if they are done. Return to oven if not done. Remove from oven and serve with juices drizzled over the meat and vegetables. I recommend a great piece of warm bread to soak up all the balsamic dressing too! Congratulations to your son on his Science Honors! Thank you! He loves his coaches and team. With his autism fitting in isn’t easy and for the most part these kids get him and it’s okay. Congrats on all your son’s achievements! The egg competition seems like fun to watch. Though, I cannot even imagine how hard it might be to create a Scrambler car. Oh, and the recipe looks delish. All these wonderful spices and veggies, you’ve added, sure, made it taste great. You have done such an amazing job with your children- congrats to your son! This dish looks so yummy and so appreciate you sharing with your busy schedule! Thank you for your kind words. It’s tough being in the middle of it sometimes and knowing all is okay. It must be tough Marci, you are running! Congratulations to your son. Love your recipes! We’ll be cooking this tonight, for dinner. Just took out chicken breasts from the freezer to thaw. The balsamic vinegar did it for me. thanks a bunch ! Archived too. Congrats to your son on his medals. 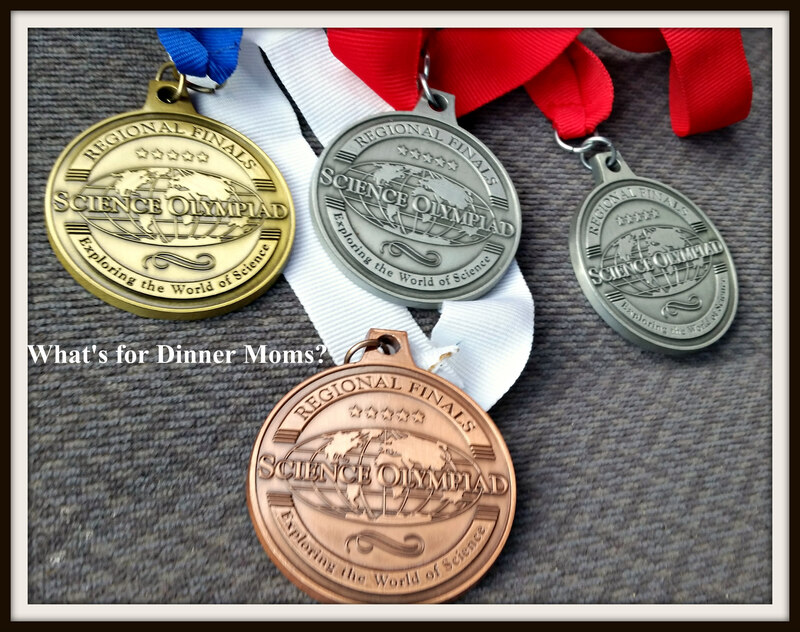 I had never heard of a Science Olympiad before so it was good to find out what it was! I don’t think we have them in schools over here ( well they didn’t when I left school 15 years ago). I love that you sit down with your children and discuss important issues like politics over a meal. I think this is a really important part of the day and also of growing up as well, forming your opinions on things and getting your voice heard. It’s also a safe environment to do so. Politics is obviously the hot topic with you guys with the presidential elections coming up!! This side of the world is watching in anticipation and with trepidation! It’s a great program in all 50 states here. Every 3 years some of the events rotate but there are always build events, chemistry events and memorization events. Sounds really good. My nephew would love this! Oh and the recipe looks really good! Loving the use of balsamic vinegar with chicken. Look at those medals, Congrats to the kiddo! 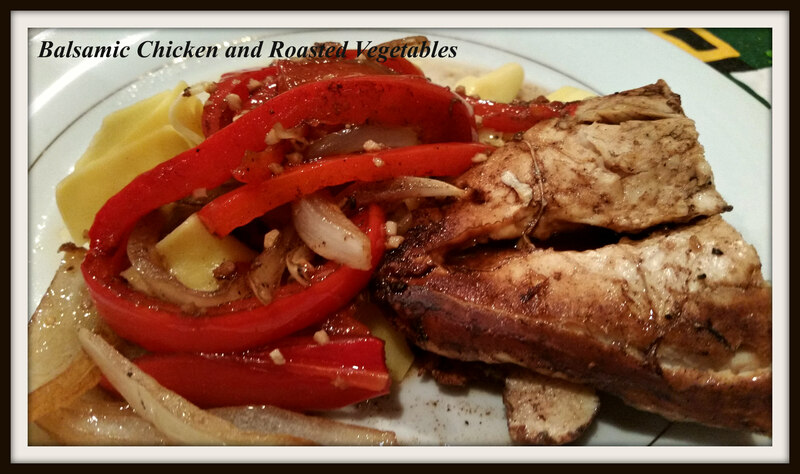 It’s hard to go wrong with balsamic chicken and roasted veggies, yumm!